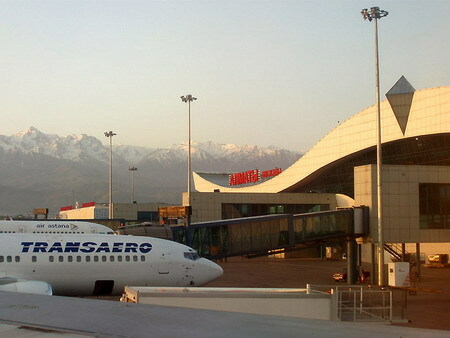 There are the airports designed to connect countries, but the airport of Almaty connects continents - Europe and Asia. For last 10 years, opportunities of this airfield were evaluated by dozens of airlines of the world. The reason of its popularity is the advantageous geographical location and size of the runway. The first runway with the width of 60 meters has the length of 4.5 kilometers, and can accept all types of aircraft. In 1998 the full reconstruction of first runway was carried out, which was equipped on all international standards (ICAO certificate). And in 2008 it was opened the second runway of the dame size, and also equipped with up-to-date facilities. For first 10 years of XXI century such giants as FedEx, UPS, Lufthansa, Asiana, British Airways, Air France and many other became the partners of Almaty International Airport. Today they make daily direct and transit flights here. The airport is considerably increased. In 2004 new passenger terminal was put into operation, and in 2007 the business terminal was added to it. For this decade the airport really increased up to world level. It was improved not only the technical support of airfield but the service in terminals. The policy of airport management is aimed on selection of qualified and polite personnel, on constant upgrading of infrastructure. The airport equipment allows to wait comfortably for one’s flight and to pass the quick registration at arrival. In addition it is connected with the city by highway, which takes from 15 to 30 minutes of way. And business terminal has special halls for negotiations and conferences. This airport was built in 1935 and the most part of existence it was regional, but today due to its possibilities and advantages it became the real giant in Central Asia.